Cloning Services: Our department offers efficient cloning services for cloning in your gene of interest, promoter, RNAi, full cassette, CRISPR/Cas9, gRNAs, etc., into our preferred backbones for either biolistic or agro transformation. Inquire for pricing and options. 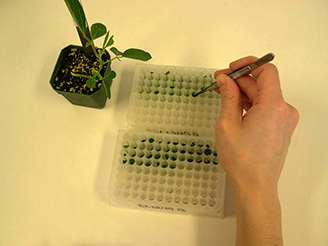 — Copy Number: We recommend that researchers use single copy events, and offer copy number screening at the seedling stage. It is a substantial expense to take plants to seed, so early screening provides the highest quality product in the most efficient manner. WCIC will determine the insert copy number of the events produced as they enter the greenhouse stage of the transformation process. Only single copy events can be advanced if requested. This will ensure that subsequent expression analysis, phenotype, and segregation is not confounded by multiple copy and possibly multiple insert events, and will ensure the highest quality downstream data. Copy number analysis will be done using a BioRad QX200 ddPCR platform. Inquire for pricing. — Gene Expression: Gene expression analysis is offered through RT-PCR/ddPRC for those researchers that would like to better understand the expression characteristics of their transgene. Inquire for pricing.